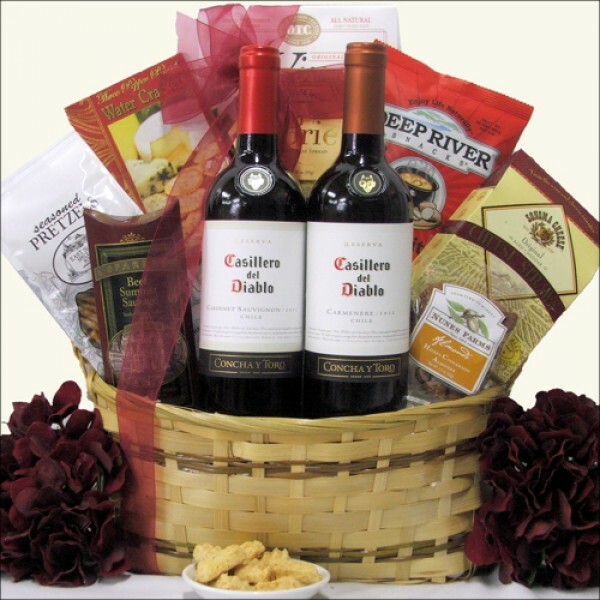 Red wine lovers will delight in this splendid Chilean Red Duet Wine Gift Basket that features the Concha y Toro Casillero del Diablo Carmenere with the same vineyard's Cabernet Sauvignon, along with an array of gourmet munchies. These two bold Chilean wines pair perfectly with zesty and flavorful treats such as Cabernet Sauvignon wine cheese, creamy Brie spread, mesquite barbeque kettle cooked potato chips, spicy cocktail almonds, assorted gourmet crackers and more. ...in a Rustic Oval Planter with Wood Trim.